Painter, sculptor and draughtsman, son of Jean-Honor Fragonard. Having been taught by his father and by David, he attracted notice at an early age and was considered the equal of Jean-Baptiste Isabey and of Hilaire Ledru in his drawings. He made his dbut at the Salon of 1793 with Timoleon Sacrificing his Brother (drawing; untraced); later he exhibited genre subjects similar to those of Jean-Baptiste Mallet, which were frequently reproduced in prints. During the Revolution he produced several allegories, such as the French Republic (drawing; Grasse, Muse Fragonard). He executed many drawings during the Consulate and the Empire; these are Neo-classical frieze compositions in which he made use of strongly contrasted lighting effects (e.g. 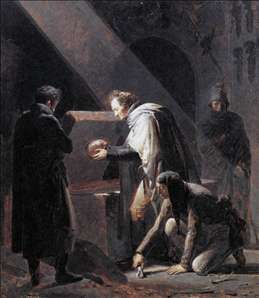 the Child Pyrrhus at the Court of Glaucias, 1814; Paris, Louvre). He developed an official career as sculptor and painter during the Empire. He took part in a competition for the Peace of Amiens in 1801 (painting; Paris, Bibliotheqque Thiers), after which he received several commissions. He sculpted the pediment of the Palais Bourbon in Paris (destroyed in the Revolution of 1830 and replaced by that of Jean-Pierre Cortot). Also for the Palais Bourbon, in 1810 he was commissioned to paint trompe-l oeil grisailles to decorate the Salle des Gardes and the salon behind the peristyle (now destroyed or hidden by the later false ceiling). In 1812 he was entrusted with the composition and execution of bas-reliefs for the obelisk that was to be built on the Pont Neuf, Paris, in memory of the Prussian campaign (not executed). 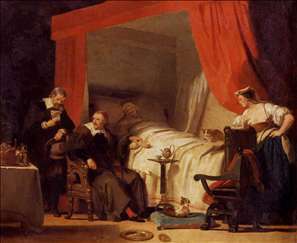 See more details about "Vivant Denon Replacing El Cid's Remains in their Tombs"
See more details about "Cardinal Mazarin at the Deathbed of Eustache Le Sueur"